Workplace transformation offers a number of opportunities and benefits as well as a number of advantages for the employee and even the employer can enjoy. It wholly benefits all the member of the organisation and gives a good impression on the clients which are introduced to the company for the first time. It increases the competitive level among the other organisation by showing its goodwill and credibility. A good and impressive work zone or layout increases the productivity and creativity of an organisation. By transforming the work place in a very modern way and less like traditional in nature, the company has already approached its first step towards building its reputation and overall up – gradation and development. It is one of the important factors to creating a healthy work environment. Lightning is one of the most important and essential physical factor in the workplace. There are two types of lightning; the lightning obtained naturally is known as natural lightning and the lighting obtained artificially is known as artificial lightning. There should be adequate lightning in the workplace or else it may lead to cause problems to the employees and can cause delay in submitting the given work. To save and modernise the workplace usage of LED light bulbs instead of tube lights will promote a good green environment. Ventilation refers to providing and supplying clean and fresh air to the office employees. There are two types of ventilation; the workplace should have natural ventilation in the form of adequate doors and windows in the correct place as this method reduces cost. Artificial Ventilation should be provided in the workplace in the form of ceiling fans, table fans and exhaust fans along with air conditioners and air filters. This will not put any exertion and make it a workable environment. The workplace environment needs to be quiet so that the employees can carry out smoothly. So then the noise in the workplace needs to be controlled as it may cause in the work activities. Internal noise needs to be controlled by the employees itself by avoiding personal conversation on the telephone as well as unnecessary talks among the employees. Noise from outside can be controlled by soundproofing the walls. Minimizing the noise externally and internally will help the employees to give better outcome and they will not get disturbed while completing the allotted task. For creating a favourable environment for the employees as well as in attracting the outsiders, the workplace should be kept neat and tidy. In doing so, the office employees automatically improves the accuracy as well as efficiency in working. This will promote a healthy environment which will not make employees sick and instead rejuvenate them to give their best and work hard in giving quality work. If the employees will not get sick there will be less number of days where employees will take a sick leave. The workplace should be secure for the entire individual in the organisation so that they feel comfortable and do their work without fear. There should be CCTV Camera which will record what’s going in the work environment where the boss has a bird’s view of knowing who is doing what. The boss can know who is utilising their time properly and how productive the work environment is. Security is important to keep record of all the happenings and the activities in the office. There should be safety in the work area by keeping fire extinguisher at every floor and department. There should be all the equipments needed in the hour of disaster or hazardous situation. The office should keep medical equipments for the employees in the times of need. When safety is kept in the mind, the employees feel safe and comfortable to work in such an environment. This promotes confidence and satisfaction among the workers. The office workplace is a place where the outsiders are coming in contact with the firm so in order to put in a better performance it is important that the workplace has an appropriate and systematic interior layout. Certain things like the colour used in the office, the floor coverings should have a good appearance to be seen by the outsiders. A certain number of additional things such as having an appropriate curtains and plants, wall hangings etc also add a beautiful appearance to the office, changing the internal system of the office completely. The outsiders will also have a pleasant appearance towards the workplace. The layout of the office should in such a way be that it is easy to monitor and control. To change the layout of the workplace one of the most important addition can be done is to increase supervision so that the office system functions efficiently if this is done all the ongoing activities in the workplace can be monitored and recorded by the supervisor, this helps in building control. Sometimes it gets difficult for the supervisor to go in and out of the office cabins when office is overcrowded with unnecessary stuff on the way so the one who is doing the layout should keep in mind to keep the layout simple and easy. There are certain works in the workplace which are confidential and have to be kept secret only towards certain office employees or the owner. For this, the privacy system in the workplace can be increased toward storing and keeping the information safe from the outsiders or from the certain number of the organisation who can misuse this information and ruin the reputation of the company. In the modern world this system of storing files in the form of paper have become outdated and consumes a lot of space in the office so in order to increase and improve and make changes in the workplace, the files pertaining to the firm should be digitized and stored in the hard disk of the companies storage. This will ensure an adequate amount of security to the files and also less physical space is required for storage of such files which will benefit the organization. In an organisation or an office there should be an adequate space in between the cabins to walk around freely without any frustration of over crowding the area. An open space in the office minimizes obstruction and barriers of shifting the work flow from one place to another. Therefore when an interior designer designs the place, they always keep in mind of keeping a proper space between the each cabin so the workers and employees can walk freely and supervisor can supervise easily. When an organisation plants trees around the company tower it indirectly promotes about planting trees to save our environment and promote green environment awareness among the employees and its surroundings. Planting more plants and flowers makes the workplace greener and refreshing for the employees to work in. 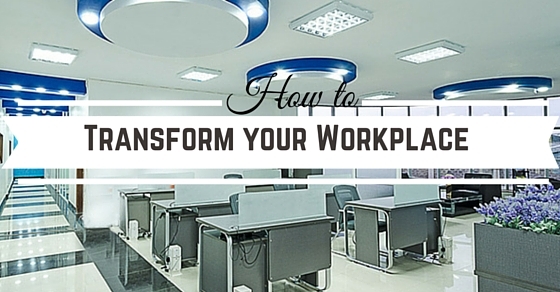 It rejuvenates and spreads healthier and happier work environment. It removes the pollution and increases the oxygen level. There should be areas in the office where employees can take 5 minutes or 10 minutes break from work and can informally connect with other employees. This actually promotes team building and healthier relationship among the employees. The advantages of having such areas are that the employees can refresh their mind from the workload and get back to their work with clear mind. The suggestion of the employees should be taken into the consideration because they are the one who are associated with the workplace and the organisation runs because of them therefore the suggestion from the employees will help the designer in knowing the needs and necessity of the people working in that particular organisation. Every organisation is different thus the same blueprint can’t be used for every company. Before renovating or transforming the office, one should keep in mind the necessities of the office instead of using its own methods and ideas which other people won’t be comfortable with. The office furniture should be set in a very systematic manner, its corner should be round and not pointy or it might hurt the employees. Creating such furniture will create safety and decrease the chances of getting injured. The furniture also determines the creativity of the work area and excellent interior designing. Such furniture gives more of a modernised look which lays a good impression on the clients and the customer that the organisation is very productive and creative. When positive thought is implanted in a human being that person will give a better outcome and excellent result, therefore it is suggested to create wall hangings which displays the aim and vision of that particular company. The employees should be inspired always by the deeds of the other great fellow being but the boss can’t always invest time in just building up the personality of the employees so the solution to this is that to put maximum wall hangings with different inspirational messages in the work area. The arrangement in the office should be done smartly and creatively. If the chairs and tables are just stacked up in one place and the place where more chairs are needed but there is no availability of chairs, showcases a bad image of the company and creates havoc in the organisation. Smart arrangement increases the productivity in the work area and removes the confusion and tension in the workplace. Therefore, interior designers are called out to help the company with their arrangement. The office desk and the cabins should be clean so that the employee will not loose the important documents or misplace them. There should be enough supply of the dustbins and cabinets. There should be adequate amount of cabinets in the work area so that all the files should be properly stacked and kept neatly. Keeping dustbin promotes a healthy and tidy environment. The office layout should be set in such a way that it delivers the uniqueness of the concept of the work that the organisation do and should focus on branding themselves by the office layout and interior that they carry out. When the office designs is not copied and a unique concept is been introduced in the company, the clients itself starts believing and trusting the organisation because of the creativity that they put. An office or a company should have a play zone so that the employee can be rejuvenated from mind and body. If the employees just keep on working ultimately it will make them dull and get de-motivated towards dedication shown to the work. This affects their health mentally and physically if there is no movement and can also hamper and obstruct their creativity in action. To create a healthy environment businessmen and owners of the company are creating play areas with ping balls, to foosball tables and etc to accelerate the growth of the employee. While setting up an organisation the owner or the business man should not only focus on the internal part of the company but it should also focus on the external part of the company. Promoting healthy environment and transforming the workspace will motivate the employees to give a better outcome and be always enthusiastic about work. Creating dull environment will only ultimately hamper the growth of the firm so changing the system of the organisation in a positive way will not only help the employees but also the organisation as a whole. The following points should be kept in mind while designing and transforming the workspace of an organisation. These points will help in considering all the factors which affect the organisation layout.